Adored children's books can feel timeless. When their authors live long lives, there's some kind of poetic justice. One example is Maurice Sendak who is the author of "Where the Wild Things Are." He recently died at age 84. Or think of Laura Ingalls Wilder, who died at age 90. But some authors outlast nearly all of their counterparts. This is even as their stories continue to charm kids who are a mere fraction of their age. Beverly Cleary turned 100 on April 12. She is one in that small but respected group. The Oregon-based author is best known for kids' classics like "Henry Huggins", "The Mouse and the Motorcycle" and "Ramona Quimby, Age 8." Over the years, she's sold more than 91 million copies of her 39 books. They have sold all over the world. Her career has been praised with everything from multiple Newbery Medals and Honors to a "Living Legend" designation. The latter came from the Library of Congress. If you've ever adventured along with the Quimby girls on Klickitat Street, you may know that Cleary is almost synonymous with Portland, Oregon. She spent much of her young life in the city. Then she turned her real-life experiences into children's books. They incorporate real places that can still be visited today. And perhaps the perfect cherry on top of a Cleary-themed jaunt through the rose-studded city is a trip to the sculpture garden. It was built in her honor in Grant Park in northeast Portland. 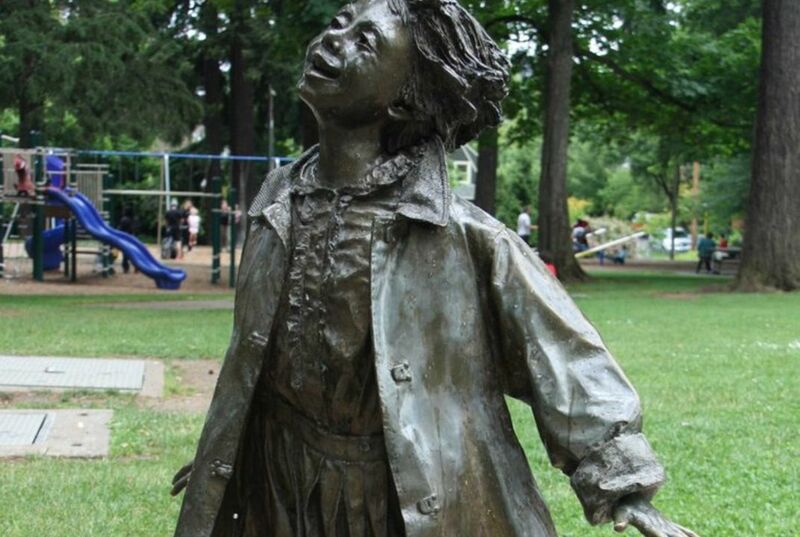 The Beverly Cleary Sculpture Garden for Children was built within the park in 1991. It was constructed by a group of librarians, teachers and Portland locals. They were eager to pay tribute to their favorite author of children's books. The park itself is featured in several Cleary books. It is most memorable as the site where Henry Huggins frantically digs up nightcrawlers. 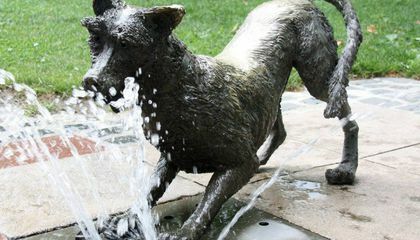 It features life-sized statues of Ramona Quimby, Henry Huggins and Huggins' dog, Ribsy. Quotes from the books and fountains make the garden even more fun. Cleary-curious travelers can also find a neighborhood map at the park. The map tells them how to explore other local sites related to the author. Want to take your Cleary sculptural viewing to another level in honor of her 100th? Stop by the Multnomah County Library's central branch. See if you can find a plaque featuring a depiction of the timeless (and, seemingly, ageless) author. Beverly clearly is my favorite author. She is the very best, best author in the whole entire world. I wrote a letter to her. I have her biography book. I have a book that I am reading called Fifteen. I really suggest it for girls. I think you should definitely meet her sometime. Leah do you know how much I would Love to meet her, I would take you and Ava with me. Why beloved children's books feel timeless is because it brings back memories to adults to when they were younger and children love child books.Children never forget their favorite books. Beverly Clearly had some really good adult books and some really good children books.Alot of people enjoy books. Adults still can read children books then the adults feel younger.Adults probably enjoy children books. Children books feel timeless because adults also like her books. Everyone enjoys a good book from time to time, so if you like to read you should start reading her books. I agree Michael.Adults are aloud to have fun even though their age range is from 20 to 120.Kids don't get all the fun just because they are young.Like I said I agree Michael. Because the more children that come into this world, when they learn how to read they keep reading them over and over again, because of their love for the books that they can read, and when they get older want their kids to read those books or even maybe want them to read it to them before they go to sleep. Beverly is a great writer because she sold 91 million copies of her 39 books and one of her books was Ramona Quimby age 8 it was one of the best books she wrote.One of my friends is one of the biggest fan of Beverly's books.